Forty years after his death, Jimi Hendrix is still leaving an impact on the music world. The recent release of Valleys of Neptune -- a collection of previously unreleased studio recordings -- rocketed Jimi to #4 on the Billboard 200 Chart, making it the highest-charting album of his career. 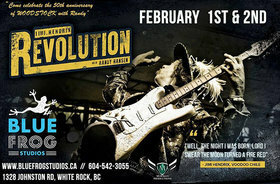 While the legend of this true "guitar hero" lives on, no one celebrates it more than the remarkable Randy Hansen. For over thirty years, Hansen has been building a reputation as the foremost Hendrix tribute on Earth. As one of the few players officially recognized by the Hendrix family, he has been successfully doing his act since the '70s, stunning audiences worldwide as he channels the spirit of Jimi and perfectly recreates the stage presence and skill of the legendary axeman. Aside from his loyal fanbase, Hansen's guitar work is respected throughout the music business. He's played alongside some of the greats, including Stevie Ray Vaughan, Steve Miller, Paul Rodgers, Herbie Hancock, and original Jimi Hendrix Experience members Noel Redding and Mitch Mitchell... Also original Band Of Gypsies members, Buddy Miles and Billy Cox. Do you know of a show that's not already up in our calendar? List it!